Today I want to show you a little bit more about the 15pcs Brush set that I got from Born Pretty Store and that I show you in this ----->post. I also made a quick video, to show you a couple of things that you can do with them. Striping Brushes: Mainly used for lines of different lenghts. I used mine to create the lines on the checkered board on the video. Angle Brushes: these are great for shading and even can be used for one stroke flowers or designs. Fan Brushes: are great for creating awesome backgrounds or layering effects - like i show on the video. Flat Stroke Brushes: Absolutely great for one stroke flowers or shading - very similar to angle brushes but bigger - for bigger designs. Dotting Tool: great for making dots to give your mani a nice look. Drawing brushes: My favorite of the set!! you can almost draw anything with it. These are some of the strokes you can do with some of the brushes. They are pretty awesome aint them? 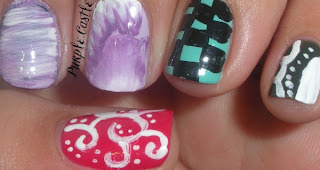 -I used a fan brush for my index finger with white and purple acrylic paints. -I used an flat brush and an flat/angle brush to create the effect on my middle finger. -I used a striper brush to create the long lines on my ring finger and then a drawing brush to fill in the squares. -I used a drawing brush for my pinky finger to create the whole design. I also used these brush set to put together the two sample manis below. You can do all kinds of designs. Don't forget that Born Pretty Store has 10% off on your next order if you used the code CJL91. This is ag great post!! I have a similar art but only use 1 of them, now I can use them for a bunch of different things! I need to buy these :-) How do you clean them? They look great to create nail art. Hello!! Today I have another award for you! this is absolutely awesome post!! !